Gaza: The Gaza Strip run by Islamist movement Hamas is a poverty-stricken and overcrowded Palestinian coastal enclave under a crippling blockade by Israel and Egypt. One of the most densely populated places on the planet, Gaza has around two million people squeezed into a 362-square-kilometre (140-square-mile) strip of land on the Mediterranean’s edge. Just 41 kilometres (25 miles) long and 12 kilometres at its widest, its land borders are with Israel and Egypt. After the 1948-1949 Arab-Israeli war that followed the creation of the Jewish state, Gaza was put under Egypt’s administration but not annexed. It was occupied by Israel during the Six-Day War in 1967. The 1993 Oslo Accords established the Palestinian Authority that had control of two-thirds of Gaza, the remainder being occupied by high-security Jewish settlements and military areas. In 2005 Israel withdrew its soldiers and thousands of settlers, ending 38 years of occupation. In 2006 Israel — which considers Hamas a “terrorist” group — imposed an air, land and sea blockade on Gaza, restricting the cross-border movement of people and goods following the capture of a soldier by Hamas militants on Israeli territory. The blockade was tightened a year later after the Islamists ousted troops loyal to the rival Fatah faction of Palestinian president Mahmud Abbas. The only entrance to Gaza not controlled by Israel is at Rafah on the Egyptian border, and has been almost completely closed since 2013. The Gaza Strip has virtually no industry and suffers from a chronic lack of water and fuel, with almost no natural resources. About 53 percent of the population is unemployed, this rising to 70 percent of youngsters, and more than two-thirds depend on aid. One in two live under the poverty threshold. More than 95 percent of the territory’s water is unfit for drinking due to overpumping of groundwater, and it suffers regular electricity cuts. In October 2018 Qatar, under the auspices of the UN, sent Gaza $60 million to run its only power station. In November Qatar promised to send $90 million (80 million euros) in aid through six monthly payments, four of which have been handed over. 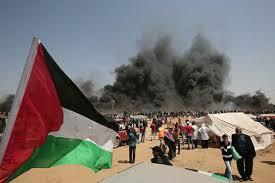 Israel has carried out several military operations against Palestinian militants in Gaza, leaving thousands dead. It launched a vast air offensive, “Operation Cast Lead”, in December 2008 to stop Palestinian rocket fire into Israel. It ended with a ceasefire in January 2009 and 1,440 Palestinians and 13 Israelis dead. In November 2012 “Operation Pillar of Defence” kicked off with a missile strike that killed top Hamas commander Ahmed Jaabari. In the ensuing eight-day flare-up, more than 170 Palestinians and six Israelis were killed. In July 2014 Israel launched “Operation Protective Edge” to stop the rocket fire and destroy tunnels used for smuggling and the movement of militants. It lead to a war that left 2,251 dead on the Palestinian side and 74 on the Israeli side, most of them soldiers. On March 30, 2018 Palestinians launched on the Gaza side of the barrier with Israel a massive protest to demand the right to return to homes in Israel from which they fled or were expelled in the late 1940s, after the Jewish state was created. The “Great March of Return”, organised by civil society groups but backed by Hamas, has seen regular clashes, with at least 258 Palestinians killed by Israeli gunfire and two Israeli soldiers also losing their lives.